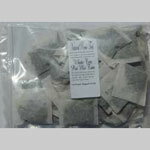 White tea is made from the same plant Camellia Sinensis as green and black teas are. The differences are White is harvested in China and it is one of the rarest and most expensive teas, the leaves are picked when they are younger and processed differently that green so it will hold more of it's antioxidants. For this reasons it has a natural sweetness to it. The white tea goes through a different process. Leaves are carefully picked from plant with a higher proportion of buds and then it is rapidly steamed and dried.